ANDY GRAY’S playing days at Leeds United may not have been as feted as those of his father Frank or uncle Eddie – but they still meant the world to him. Weened on the club from a young age due to his famous family link, the colour that coursed through his veins was always white and to step out for Leeds, something that thousands upon thousands of the club’s fanatical support can only dream about, turned into delicious reality. Gray’s time in the limelight was brief in comparison to the ‘old man’ and his uncle, but he was afforded one famous moment at a fabled venue – if not the result – and a sweet encore in his career swansong as well. Representing Leeds, whatever the occasion, was always a badge of honour. On keeping it in the family by donning the famous white jersey, Gray, 37, said: “To play for Leeds was a dream come true, really. “I always remember watching my dad and uncle play and going into training and being around Leeds all my life. “I remember watching Leeds play in the early Eighties. I actually remember the Everton cup tie when they beat us 2-0 (in 1985) pretty vividly really. “A bit later on when I was at school, I also remember promotion and the championship year. I went to a few home games and was a ballboy a few times. “A lot of people mention following in my family’s shoes and making a lot of it. But it’s just my dad and my uncle really. I never really felt it myself or thought about it, if I am honest. “They gave me a lot of encouragement, but didn’t push me. “I was obviously delighted to sign for Leeds. I used to clean Tony Dorigo’s boots and he was a good tipper and I couldn’t complain! Harrogate-born Gray was on schoolboy forms with Leeds from April, 1993, with the likes of Mark Jackson and Jason Blunt in his year group, with Ian Harte in the year above and Alan Smith in the group below. Gray’s debut arrived in a League Cup tie at Notts County in September, 1995 and his full league bow came against West Ham in January, 1996. But it was just his fourth start for Leeds, at the tender age of 18 in the 1996 League Cup final against Aston Villa at Wembley, that proved the apex of his Whites career. That said, his pride in representing his boyhood club at the home of football was tempered by a 3-0 loss to the Midlanders, although on a day when Leeds pretty much did not turn up, the teenager could at least be consoled by being one of the club’s better performers. “And I just said: ‘What do you mean the weekend?’ That’s all he said to me and I played about 60 minutes and I think that was the plan all along. “We travelled down on the Thursday and did a bit of training on the Friday and I had a bit of an idea I might be starting. But when the manager told me I was playing on the Saturday, it was still a bit of a shock. “He told to go out and enjoy it and make sure I made the most of it as these games pass you by. I couldn’t say anybody enjoyed it that much, getting beaten 3-0 though. The man who gave Gray his debut, Howard Wilkinson, left Leeds early on in the 1996-97 campaign and he was soon out of the first-team fray under George Graham before starting a nomadic career that took in many ports of call in Yorkshire. A brief spell back at Leeds at the twilight of his career in 2012-13 followed, with his final United goal coming in a White Rose derby at home to Hull in September, 2012. These days, he is back to what he always been throughout his life – a Leeds fan. 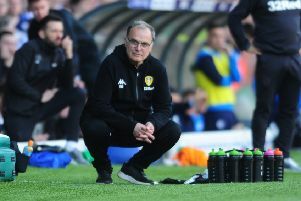 On his path away from Leeds and ultimately returning, Gray added: “Howard Wilkinson left the season after and George Graham came in and he wanted to get back to more experienced players and a rigid formation really focusing a lot on defence and I ended going to Forest and moving around here, there and everywhere. “I came back years later when my contract ran out at Barnsley and Neil Warnock, who had me at Sheffield United, said he wanted someone with experience sat on the bench and I jumped at the chance to go back to Elland Road. “I loved that period, even though I didn’t play a lot, although I made a few appearances off the bench. “It was nice to come on and score against for Leeds in that game against Hull at Elland Road. “But it was fantastic to manage to play for Leeds again and I still go and watch them now.